With the capital of the Netherlands struggling to accommodate over 880,000 bicycles in a city of 780,000 citizens, Amsterdam is considering underwater bicycle garages and other radical ideas to park its bikes. With just 2,500 designated parking spaces available to handle the hundreds of thousands of bicyclists daily, the city has drawn up plans for a 7,000-space bicycle facility beneath its waterfront, as well as floating garages to meet the soaring demand for bicycle parking. The new parking garage beneath the IJ, a lake in the center of Amsterdam which was formerly a bay, would connect via underground tunnels to major transportation hubs, like Central Station and the metro system. The plans also call for creating a total of 21,500 new bike spaces around the station by 2030. While two new floating islands with space for at least 2,000 bicycles each are to be completed by 2020. The influx of bicycles in the city has led to some high costs for taxpayers, who must pay for the removal of illegally parked bicycles, at a cost of up to €70 per bike. 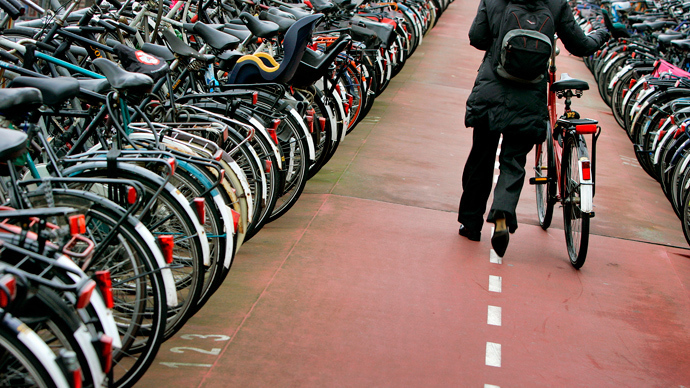 A phenomenal number of 73,000 bicycles were removed by authorities from the streets in 2013 alone. Over 50 percent of Amsterdam’s 781,000 residents use their bicycles each day, with 43 percent relying on bicycle transportation for their daily commute.